I’m closing out the last week of National Adoption Awareness Month with the second part of twin posts from the Adoption Bloggers Interview Project. Part 1 was where I interviewed Becky of Scared to Be Happy, and below is the part in which she interviewed me (originally posted on her blog). Becky: What motivates you to write? Have you ever faced writers block, and if so, how have you overcome it? I’ve always been a wonderer. I’ve always liked to see the same thing from different angles to understand it better. I find, when I’m writing a post, that in trying to be clear with my reader, I’m also finding clarity for myself. This is why some consider writing as therapy — it requires focus to take an idea or issue or emotion and reduce it to words. It’s the yoga equivalent of finding my core, of honing inward. Writing is introspective and causes me to be more honest with myself, with my motivations. I also like to write because it makes me more observant, more present as I move through my day. As for writer’s block, I do get it every once in awhile. Sometimes I just take a short break from my blog (usually not more than a week). Sometimes I just sit down with a blank page and commit to be there for an hour. If it flows, great. If not, so what. Guess what…? Usually it flows when I commit to showing up. Becky: If there were one misconception you could clear up about open adoption, what would it be? The first is that open adoption is super-hard, that only exceptional people can “do” it. True, parenting in open adoption (OA) can be more complicated than parenting in a biologically-built family, but with complexity often come unexpected gifts that you don’t get from simplicity. Know what’s hard? Relationships! In them we don’t always feel we have the power we want. We don’t always know how to get our needs met. We fear someone else being a “wild card” that makes things be beyond our control.This isn’t unique to open adoption relationships, though the feelings may be heightened in OA because of strong swirling emotions — guilt, fear, debt, regret, anger, sadness, envy. The other misconception is that love can ameliorate all possible adoption-related issues for the adopted child. Some people are probably wired to be relatively issue-less, and others not so much. Parents (biological and adoptive) never know which they are getting. I remember thinking that my children would come to me as blank slates whom I could fully influence with my love and guidance (and my husband’s). I forgot that my kids would come to us with 23 pairs of other people’s chromosomes, which — surprise — pack a punch. These babies already had personalities by the time I met them as newborns — shocker! So, because your child may have issues with identity formation as s/he grows up (and really, who doesn’t?) you might as well provide what you can to them about their birth parents. Maybe that’s contact, maybe it’s open-hearted conversations, maybe it’s just you not being threatened by their wondering and processing. Becky: How do you feel about PAL (positive adoption language)? Do you think it affects the way your children view their family structure? I’m all for being mindful, for choosing one’s words deliberately. But if we’re too careful, if we tiptoe around the realities of adoption, we indicate that there is something to hide and that there is shame around adoption. For example, I don’t say to my daughter, “Crystal put you up for adoption.” It sounds so careless and impersonal, like you’re talking about a discarded toy. In reality, Crystal’s decision was anything but careless and impersonal. Instead, I would say, “Crystal couldn’t parent a baby at that time in a safe way, so she decided we would be your parents and she placed you with us.” I try to understand how the words would feel to my child. I wrote about this topic once regarding whether it matters if I say “we adopted my son” (which indicates it’s something we did – or “my son is adopted” (which indicates it’s something he is). He seemed to pick up on this distinction, as I found out one morning at Take-Your-Parents-to-School Day. But does it really matter? Some adult adoptees have said that being adopted IS who they are. Or at least a part of who they are. As for language affecting how our children feel about our family structure, yes, I believe it matters. The more secure and issue-less I can be about the way we became a family, the better the soil from which my emotions and words grow, and the more secure and issue-less our kids will have the opportunity to be. For then they can be left to deal with only their issues and not mine. 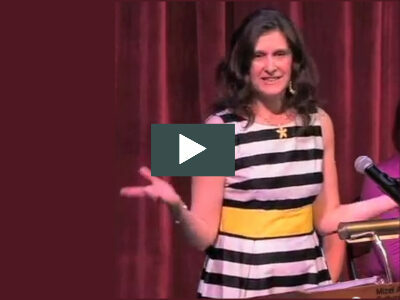 Becky: What has been the hardest part of your adoption journey so far? Once we set out on the adoption journey, back in 2000, most everything seemed to fall into place relatively easily. It was the infertility process that brought me to my knees. Once I learned how to relax the grip I had on controlling my life, I was in a better position to yin-yang my way through the adoption process and now the parenting process. I was always good at the yang part — making things happen; I had to get comfortable with the yin part — letting things happen. Becky: What do you like to do to relax? I enjoy practicing yoga. For an hour I try to bring my awareness to the confines of my mat. It’s a practice of focusing attention, of taming the wild-child that is my mind. Yoga yokes my mind and my body and helps me remember to be more present even off my mat. Through yoga, I’m beginning to “get” that life is a journey and not a destination and shed the “I’ll be happy whens.” In yoga, everything is a process and no pose is ever perfected. Even savasana, corpse pose — the pose of complete relaxation at the end of a class — even that one! I also love to read and write and do cool things with my kids like paint pottery. My daughter, 11, plays volleyball and my son plays whatever sport it’s the season for, so Husband and I spend a lot of time cheering them from the sidelines. Becky: Being a self proclaimed new age libertarian, how do you feel about the upcoming election? I wish we could break free from our two-party system. The way it is, a candidate doesn’t have to get you to vote FOR him (or her); he only has to get you to vote AGAINST the other guy (or gal). So campaigns are based on smear and fear and that makes everyone feel dirty.My family lives in a purple state (and a purple home) and are thus bombarded with ads and robocalls and fliers that indicate only jerks, idiots and crooks want my vote. My kids have been told by the campaigns that no matter who wins, we’re all doomed — DOOMED I tell you. Husband and I have been doing some damage control surrounding these ubiquitous messages. Becky: Tell about your upcoming book on open adoption. I was thrilled to announce that my project had a heartbeat last December and that I was going to give birth, metaphorically speaking. I spent the next several months gestating The Open-Hearted Way to Open Adoption: Helping Your Child Grow Up Whole with the help of a lot of midwives (and their male equivalent; midhusbands?). 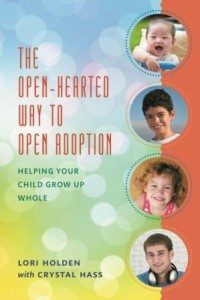 My daughter’s birth mom, Crystal, is a contributor to the book, as are a host of other adoptive parents, first parents, adult adoptees and adoption therapists and advocates who shared their insights, viewpoints and wisdom with me — many who are part of this Open Adoption Bloggers Interview Project! The book will be published by Rowman & Littlefield in April of 2013, and if you’re interested, you can read early reviews and pre-order on Amazon. It was a pleasure to work with Becky on this project! 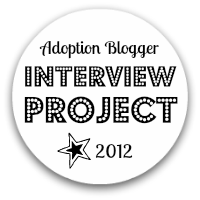 For more insightful adoption reading, visit The Adoption Bloggers Interview Project 2012. 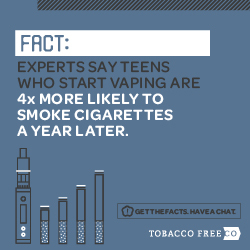 Thanks for sharing – can’t wait for your book! Love this! In trying to find how I feel about adoption overall, it’s vulnerable, open, and thoughtful conversations like this that speak to me.